Amanda Radke, children’s book author, reads her newest book “Can-Do Cow Kids” to the Pre-K through second grade students at Sanborn Central on Thursday. Her daughter, Scarlett, sitting next to her mother, is a Pre-K student at Sanborn Central and one of the main characters of the book, along with her two brothers, Thorne and Croix. March 14 was National Ag Day, and to celebrate, the Sanborn Central/Woonsocket FFA Chapter invited local author, Amanda Radke, to visit Sanborn Central. However, as has been the case many times this winter, her visit that day had to be postponed due to the weather. So, on Thursday, April 4, Amanda Radke visited Sanborn Central to speak to the high school students about careers in the agricultural field and about the life-long benefits for someone to be a member of FFA. While at Sanborn Central, Radke also read her newest children’s book “Can-Do Cow Kids” to the elementary students. She made it an interactive reading, with the elementary students shouting out some of the common lines in the book when Radke asked them to. 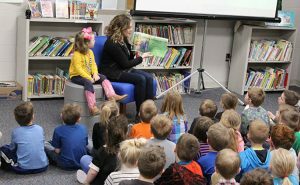 Radke’s daughter, Scarlett, who is a pre-school student at Sanborn Central and one of the main characters in her mother’s new book, helped her mother present the book to the other elementary students. …Read on and see more pictures in this week’s issue of the Sanborn Weekly Journal!